Curved edges create a soft, modern look. Fused with a nonslip backing, this sophisticated frame is comfortable to grip and practical for everyday use. 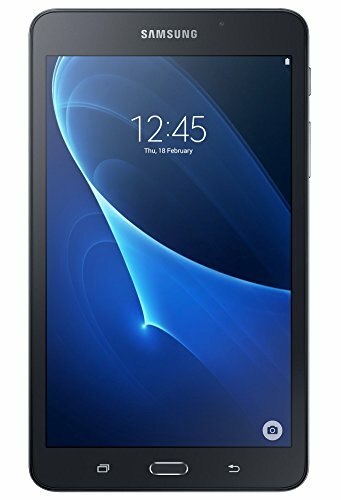 The slender profile of the Galaxy Tab A (2016, 7.0), along with its extended battery life, is so light and compact you can take it anywhere. Capture true-to-life pictures of every special moment with the Galaxy Tab A (2016, 7.0)'s autofocus camera. Diverse effects, such as animated GIFs and panoramas, let you take more lifelike and fun photos. Keep going for longer with a 4,000mAh battery. Whether it's watching videos outside or surfing the web on long journeys, this battery won't let you down. Plus with expandable storage you can keep all the content you could ever wish for. Kids Mode gives parents peace of mind and kids the freedom to safely explore. Parental control options offer flexible safety solutions, while specially designed content is both educational and entertaining. Take your favourite radio stations with you on the go. Hybrid Radio combines FM and online broadcasts, lets you create your own favourites, and even records radio segments to share with friends.